Discussion in 'Amateur Radio News' started by W5TXR, Mar 27, 2019. When automobiles were introduced they had no electrical system, they had a hand cranking front to start. With the introduction of the lead acid battery the 6 volt electrical system was born. After automotive electronics became more popular the need for 12V was apparent. the fact is that cars made today have a tremendous amount of electronics. I've read that initially cars will have a 12/48 Volt hybrid system. This makes perfect sense, I like this idea. We as amateur radio operators need to be thinking about the future....A Yaesu FTM-400XDR that has multiple DC voltage selection? A selectable multi voltage (12/24/48) volts wouldn't be that difficult to engineer? As hams this isn't a real big issue, just something to ponder when you purchase that new Chevrolet and Yaesu HF mobile. As a student pilot I would like to see a multi voltage amateur transceivers, most smaller aircraft have 24V electrical systems, although 12 is easy to obtain because there is usually (2) 12V in series. The Yaesu EDC-21 will work in 24V aircraft for power a FT-2DR HT, I've tried it. When I worked for Motorola we had special Micor and Spectra transceivers just for locomotives because they use 72 volts. I wonder if Astron makes a 48 V bench power supply?? N8FM, W3MT, KK6JKC and 2 others like this. The change to 48 VDC will probably be painful for mobile ham operators. The change to 48VDC will also be an opportunity for the business of car accessories and aftermarket devices. Many FET and regular transistors intended for high power RF amplifier designs work better at 48 VDC. However, due to severe RFI problems from the switching power supplies and switching motor control systems in electric cars, reception of HF signals on the airwaves may become difficult or nearly impossible. Due to EMC problems, high power RF transmitters in the mobile may tend to cause your electric self-driving AI robotic car to fail in unpredictable ways. The present trend in the automotive industry is the apocalypse of HF mobile. K9FV, AC0OB, KK6JKC and 9 others like this. 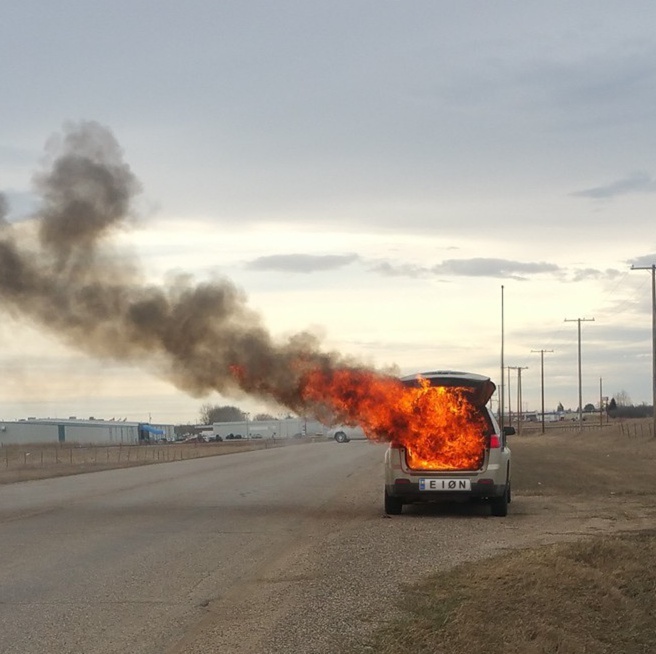 KQ6XA, there have been a number of instances of Tesla batteries suddenly failing spectacularly, the only warning is a hissing sound from under the hood and suddenly your new $100k toy is on fire-a fire that is quite difficult to extinguish. Fire depts in Silicon Valley are now having to budget for firefighters keeping watch on Tesla car fires overnight, because the batteries can reignite without warning, even when the fire is supposedly out. Tesla has been forced into severe cost cutting measures-at one point Tesla was within a few weeks of failing, according to Elon Musk-and the results have been unpredictable. The new smart cars are operated via smartphone and need a constant high speed internet connection to keep going. Even worse, 5G networks apparently use higher Ghz signals than the older networks, so Verizon is going to have to put up zillions of 5G hotspots to serve the Internet of Things adequately. So basically you're driving along and suddenly lose your car's 5G internet connection and your car suddenly stops dead, since it can't go if it can't find the servers. America has a long history of rushing headlong into new technology without considering the implications. K7IN, KG7TUO, WB5PDZ and 3 others like this. That's an amazing example of a 10^-9 probability elevated to the grandeur of fear mongering. Honestly: do you think the people involved with 5G haven't already thought out the issues you want us to shudder at? Surely you are aware that hams--including those who read these very pages-- are among the tops folks who are pioneering and pushing 5G? Are you saying our colleagues are evil, ignorant, or just naive? NI0P, N0CTL, K8AKC and 7 others like this. Forty-eight volts may be entering the borderline region of real problems. A 42 volt DC source can sustain an ARC! That's why aircraft systems are often 28 VDC. With the challenges that a now smallish number of electrically-powered cars offer when using potentially unstable lithium battery chemistry, some serious consideration should be given to developing a suitable "arc fault current interrupter" AT both battery terminals! America has a long history of rushing headlong into new technology without considering the implications. Fill us in on your list..
You can skip Midgely. We all know about leaded gas and freon. Today's inventors are a damn sight more thoughtful than you give them credit for. N0CTL, N6XJP, AG5DB and 2 others like this. What's the saying: 'The Future is Now'? WD6DPX, US7IGN, W7DCP and 3 others like this. A wire of a given size can carry four times as much power at 48 volts as a 12-volt system. In a DC system, power (watts) equals the volts times the amps. A 12-volt wire controlled (limited) by a 15-amp fuse could carry 180 watts. Step the power to 48 volts and the same wire could carry 720 watts. That's a correct first-order analysis, but the effect becomes even greater when you account for the effect of the voltage drop in the wire. That wire carrying 15A will drop some voltage according to Ohms law. The voltage drop depends on the wire resistance, which in turn depends on the gauge and length. If you keep the wire and current the same while quadrupling voltage, the voltage drop in the wiring will be the same, but that drop will reduce the delivered voltage at the load by a proportionally lower factor when the source voltage is higher. A one volt drop is eight percent of 12V, but only two percent of 48V. Be that as it may, there are practical reasons why changing the standard may be difficult. Think of all the gadgets that can plug into a lighter socket. And that's just the beginning. Fuel pumps, light bulbs, horns, car stereos, trailer wiring harnesses, the list of compatibility issues would be long. So you would have 4 12v lead acid batteries based on how regular cars are? When is this supposed to take place, and aren't there step down converters that can step the voltage down from 48 to 12 volts? I was looking at a page with some flat solar panels, and it said not to put them in series or parallel. KK4HPY, VU2VIZ and NU4R like this.